I knew I wanted to be a veterinarian when I was 5 years old. At age 14, in 1966, I started work in the first of many veterinary clinics. Now, caring for you and your pets as family is my passion and I dedicate my whole life to this purpose. I graduated from The Ohio State University with my DVM degree in 1977. After ten years of clinical practice, I became discouraged with the state of our pets’ health and knew that there must be something else. In 1988, I discovered veterinary acupuncture and received certification by the International Veterinary Acupuncture Society. This opened the door to the world of holistic medicine. In 1992, I became certified by the National Association of Natural Health Professionals. I then went on to complete a year’s training in veterinary homeopathy with the world-renowned Dr. Richard Pitcairn. 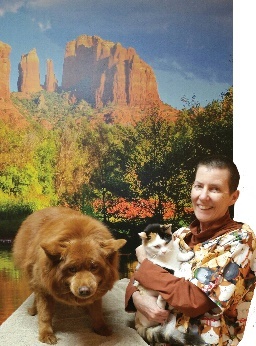 In 1993, I sold my veterinary practice in Maryland and moved to Sedona, AZ, a very spiritual place, seeking a spiritual journey. While there, I became Buddhist and took ordination as a Tibetan Buddhist nun in 2002. I believe in the equality of all life and dedicate myself to the relief of suffering. 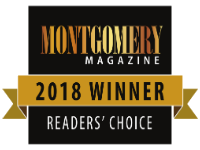 Since I believe in the motto “Healer Heal Thyself,” I completed a self-healing journey and learned Energy Healing at the Barbra Brennan Energy Healing School and the School for Enlightenment and Healing in 1994. After spending time volunteering during the Katrina Relief efforts, I volunteered for Tara’s Babies Animal Sanctuary. This was a life altering experience – seeing so much suffering and helping the animals and the people so affected by that storm. I have also volunteered for Garuda Aviary Parrot Sanctuary in Poolesville, MD. Upon my return to Maryland in 2006, I worked in Bethesda at Veterinary Holistic Care. Then in 2013 Dr. Kitty Raichura and I established Holistic Veterinary Healing. As I practiced holistic medicine with my animal patients, more and more of my clients asked me if I could treat them too. I decided to deepen my studies and spent three years in postdoctoral training at Tai Sophia where I earned my Master’s degree in Human Acupuncture in 2010. 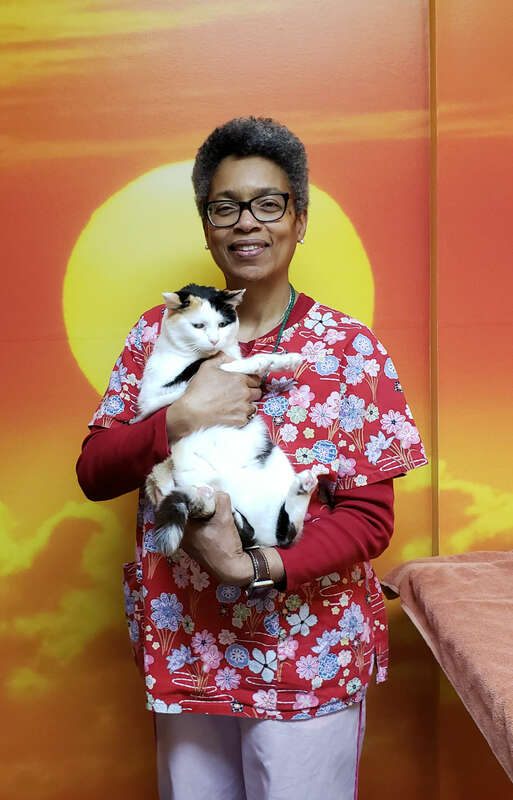 I saw both human and animal patients until my partner, Dr. Kitty Raichura, died in 2016. Since then, I have dedicated my skills solely to animal patients. I live with two other Buddhist nuns and our three dogs: two Peke-A-Poos, Oliver and Serena, and Janelle, a chow husky cross who comes to work with me every day and acts as the clinic nurse calming the patients. In my spare time I like to go to the movies or have a meal with friends. My favorite pass time is sitting in my recliner relaxing or meditating and watching my dogs sleep. 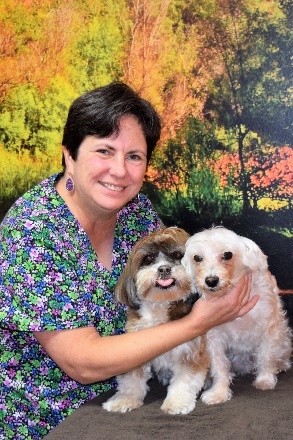 Cecelia Bonfils is the HVH Hospital Manager and enjoys being able to bring her dogs, Lily and Zoie, to work with her every day. Cecelia was born in Washington, DC and moved to Montgomery County as a child. She even graduated from Seneca Valley High School. After college she lived in Georgia for 14 years and returned to Maryland in 2005. She has worked as a mediator, a church administrator, a paralegal, and an office manager. In her spare time, Cecelia likes to read fiction and walk in the woods. Julie Rand has been with HVH since August 2015. She graduated from the University of Maryland and has always lived in Maryland. She and her husband have two daughters and have owned and managed their own general contracting business since 1993. Currently, Julie has dogs, cats and a hermit crab that is over 12 years old. She has had a variety of other animals including hamsters, fish, mice, guinea pigs, geckos, and a horse. Julie has fostered both dogs and cats, and has volunteered for various animal related organizations. Now, instead of fostering pets, she enjoys sharing with others about using holistic natural methods to keep their pets healthy. Julie worked for Nature’s Variety from 2007 until 2010 when she began working for Answers Pet Food. 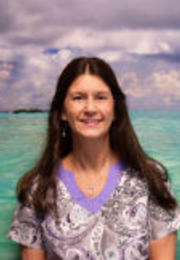 She enjoys spending time with her family, walking her dogs, reading, gardening, and dreaming of being at the beach. Anne joined the Holistic Veterinary Healing (HVH) family in 2017. First, to gain a better knowledge of animal handling, she studied dog grooming of Dirty Dawg Grooming. Then, as part of her Veterinary Assistant training at Montgomery College, she interned at HVH in the spring of 2017. Anne also works part-time as a Civil Rights/Equal Employment Opportunity Consultant with the Federal Government. In her eyes, working to better the lives of animals is a natural part of being an advocate for those who haven’t found their voice, or don’t have the ability to speak for themselves. Anne lives in North Potomac with her partner Paul; she likes to sing and laugh loudly. Robin Byrd joined the HVH team in late 2018. She has been working in the animal care field for 27+ years. Her love of animals led her in many directions, from working as a graphic artist to becoming a Veterinary Technician. Robin has experience in K9 behavior and training, equine management, and grooming.These fields led to her following her dream of working in the field of veterinary medicine (includes working with exotics). She became particularly interested in the field of Holistic/Integrated medicine when one of her dogs developed a food allergy and she was unhappy and frustrated with the way conventional veterinarians were treating it.She started doing research and discovered information on over-vaccinations, titers, food therapy, and much more.Thereafter, she changed her dog’s diets and her life’s direction. 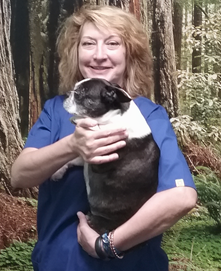 Now, as a Veterinary Technician, Robin specializes in a combination of energy healing modalities (which has become her own specialty blend over the years which she calls Energetic Body Work), these include Reiki, Shamanic, color/crystal therapies, Tui Na massage, FIT (Functional Indirect Technique, using osteopathic principles), Energetic Body Work, and Animal Communication.Among her many other responsibilities at HVH, Robin can treat your pets using these modalities as needed. Robin does not currently have any pets of her own, but has many extended furry family members from pet-sitting for friends, neighbors, and her extended network.When she is not working, Robin loves spending time with family and friends and is studying to get her Doctorate in Metaphysical Studies. You can also find her going to the movies, reading, bicycling, taking long walks in the woods, and riding horses. Luna came to us from a feral colony in early 2014, right after we opened the clinic in December 2013. She is a Domestic Short Hair Calico. 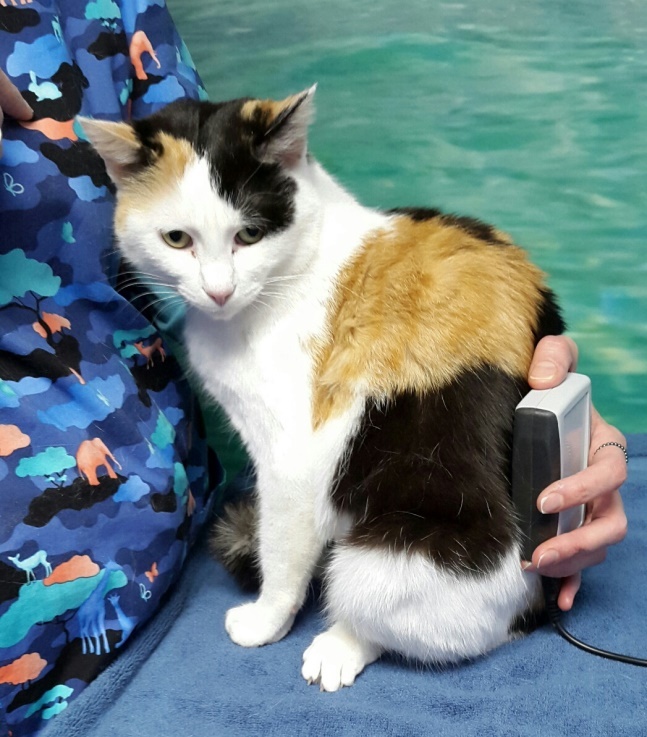 She can be found in various locations throughout the clinic but her favorite place is in the lobby perched on her cat tree or lounging on top of the fish tank wrapped around the warm light fixture. She enjoys being scratched under her chin and behind her ears. Luna has quite a few toys and will willingly play with you. When she is not sleeping or playing, she likes to watch the birds and people go by the large windows at the front of the clinic. Above, she is demonstrating receiving a cold laser therapy treatment. Luna is quite dog savvy and knows when to stay out of the way and when to play. She has never wanted to run out the door so do not worry if you see her sitting by the door to greet you.